Including the symbols, meanings, and cost of the temporary tattoos. It's safe to say most people have heard of henna tattoos, but how many people actually know more than a few basic facts about them is a whole different story. We're here to fix that. For those who don't know anything about henna tattooing (also called Mehndi), it's an ancient Indian practice that uses temporary brown dye rather than ink to create designs with significant and often spiritual meaning. While the form of body adornment dates back a cool 5,000 years, it's generally used today to express luck and happiness and is often featured at ceremonial events like weddings and births. If you attend a traditional Indian wedding, henna will almost always be a part of the celebration. Now that you've got a primer on the practice, let's dive into the details, shall we? Like your typical ink tattoo, henna can be applied almost anywhere on the body, albeit certain locations hold more significance than others. For instance, henna tattoos placed on the palms has been said to allow the person having it done to be able to receive and offer blessings. A few common designs people tend to get on their palms are mandalas, the sun, and flowers. On the flip side, when henna is applied on the top of the hands, it suggests protection and often includes shield designs. Another fun fact: For men, the right hand is considered projective, whereas the left hand for women is receptive. 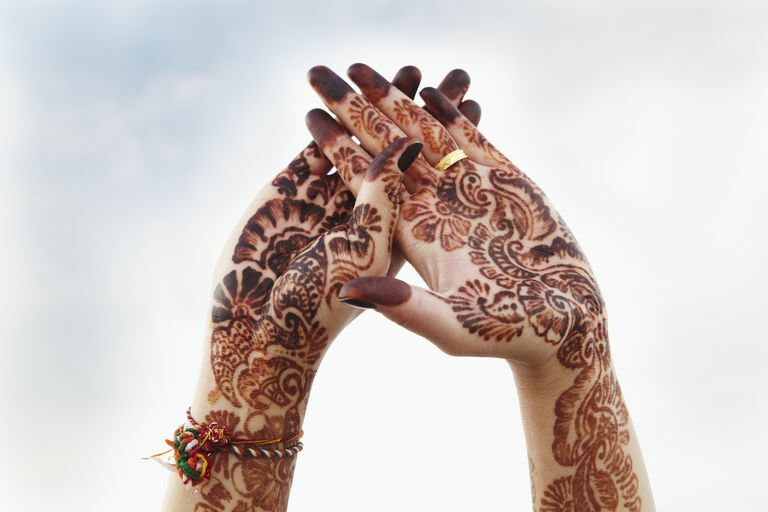 Aside from the hands, the feet are also a spiritual place to get henna, as it's believed in India that they connect the body, mind, and spirit with Earth. If you're new to the world of henna tattooing, chances are it'll be difficult to decide what to get. Below are 10 different designs—along with their meanings—that you can't go wrong with. Sahasrara: This Hindu flower-like symbol is said to unite the soul with a divine sense of force. Peacock: The proud peacock symbolizes beauty in Indian culture. Swans: The beautiful white birds symbolize success and beauty. Birds: Birds are believed to serve as the messengers between heaven and Earth. Dragonflies and butterflies: The gentle creatures symbolize change and rebirth. Paisley designs: Intricate and scrolling paisleys are very common and can represent fertility and luck. Flowers: Flowers and petals symbolize pure happiness and joy. Vines and leaves: Vines and leaf henna designs often represent devotion and vitality and are commonly done at weddings. Eyes: Ancient eyes in Mehndi art often represent the reflection of the evil eye, which is thought to turn any evil wishes back onto the gazer while also offering a spiritual form of protection. Snakes and lizards: Reptiles are often considered the seekers of enlightenment in henna practices. A Mehndi or henna party is a pre-wedding celebration in Hindu and Sikh cultures in which the bride gets henna applied to her palms, the back of her hands, and feet. The time-honored tradition is typically held at the bride's home or at an outside venue where people can lounge, relax, and really take in the meaningful experience. For Hindu brides, henna is applied during what's known as a Mehndi-Ki-Raat, which simply translates to Mehndi night. It's where the bride-to-be is told all the secrets of a happy marriage and home by her surrounding female family and friends. In Moroccan celebrations, henna is applied to both men and women in many forms of talismans for luck and protection. 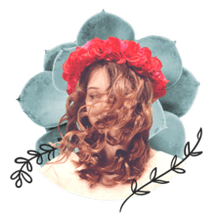 These particular parties can last for days and usually include food, dancing, and music as the art is applied liberally on bodies to offer protection. Henna tattoos are typically far, far less expensive compared to ink-based tattoos done with a gun or stick and poke tools—both of which can cost anywhere from $100 to $1,000 depending on the size and where you go. By less expensive I mean henna can cost you as little as five dollars at fairs and craft shows. For larger pieces and more intricate designs, they can get pricier, but still nowhere near what a permanent tattoo can cost you. Now let's discuss longevity. While there a few things you can do to help your henna tattoo last longer—like covering it up while you're showering—they typically last for three to four weeks. After 10 to 15 days, you can expect the dye to start fading, but before then it should have a super-strong color and opacity. Interested in learning how to do henna yourself? If so, the best way to master it is simply to practice, practice, practice. It might sound cliché but it's true. Watching YouTube videos, reading books, and talking to experts are just a few ways to familiarize yourself with the art form and to get educated enough to be able to do it on your own. Once you've learned the significance of the patterns and symbols and feel confident in a few basic sets, you can then start to practice on your family and friends who are willing.